Advisor is a low touch, intuitive interface that quickly GUIDES users to the lowest cost or most desirable printers (prior to printing) with communication that is as easy to understand. Have you ever asked your employees to print to low cost printers, only to find that a week or two later they are back to their old bad habits? GreenPrint is well aware of this challenge, and has addressed this issue with the introduction of GreenPrint Advisor. GreenPrint Analytics can be centrally distributed to all computers in your organization. 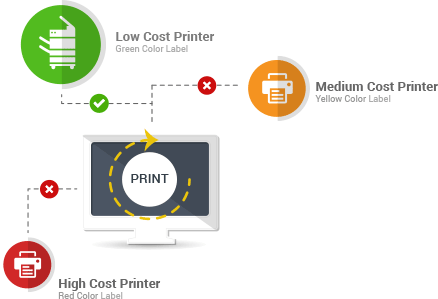 Saves cost by guiding users from high cost printer to low cost printers. Reinforces good print habits by giving option to your user to choose the low cost printers. Provides opportunity to electronically archive documents. Provides optional path to waste reduction through preView+. GreenPrint Advisor can be fully integrated with GreenPrint Analytics. Print per page cost data is imported into Advisor from the administrative console, and allows you to easily group printers by similar cost attributes into the Green, Yellow, and Red categories. Analytics accurately tracks and measures print volume and associated costs for each of the color coded categories. Reports can be generated for your entire organization, for groups or departments, or even . Advisor also provides a simple, optional path for users to interact with GreenPrint preView+, which allows users to identify print waste and eliminate it BEFORE it goes to the printer. Are you interested in managing print consumption and a huge savings opportunity! Send an email to sales@printgreener.com for further discussion and business inquiries.